Games Workshop Warhammer, Marauder, Ral Partha, Champion of Khorne. 10 misc animal warrior pcs. All are metal and most are unpainted. 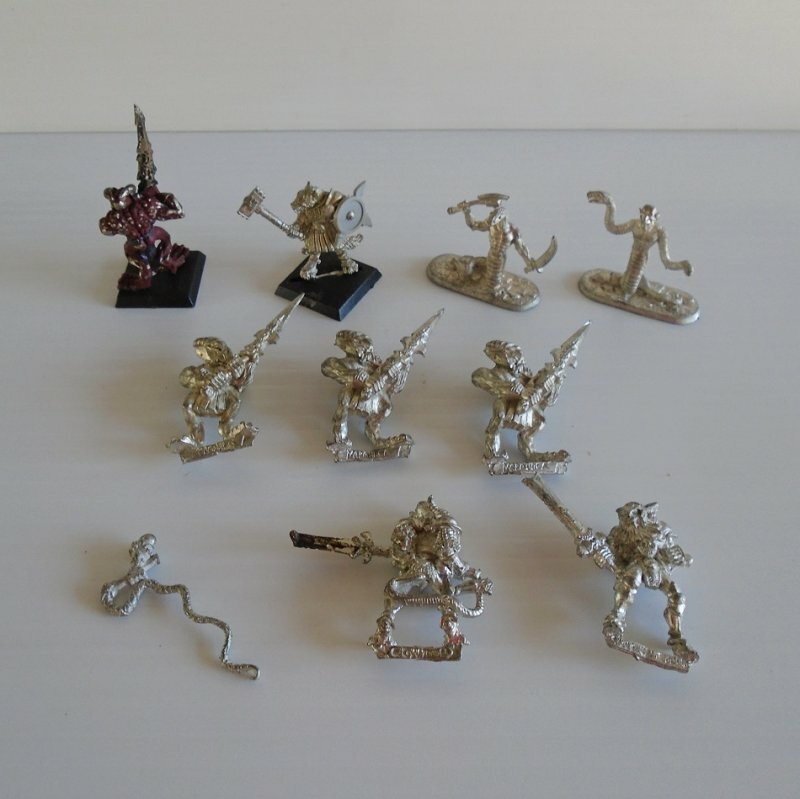 This listing is for leftover pieces used with either Warhammer, Dungeons and Dragons, Mage Knight, or some other game. Sorry, but I can't figure out which game they go to. Most pieces are marked with either "Maurauder", "Ral Partha" "Champion of Khorne", or another name that I can't read. I'm not sure what the various animals are, but 3 of them are snakes. All are metal. 2 are partially painted, the remainder are unpainted. One or two may be incomplete. I can't tell for sure. 5 do not have a base but they have the bar along the bottom that slides into a base, (if you have extra bases). I have a tremendous amount of various figurines and parts in both plastic and metal. Some are painted, some are not, and some are partially painted. Some are unused. My problem is that for most, I have no idea which game they are for, whether if they are for Warhammer, Dungeons and Dragons, Mage Knight, or some other game. Just put the name 'Warhammer" in the search box on any page and you'll be able to see them all. Quite a few years ago I purchased a storage unit at an auction and in that unit were several good size boxes of these types of figurines and accessories. There had to be several hundred figures. I had no idea what these pieces were or what game they belonged to, so I packed them up and they've been sitting in my garage for eight or nine years now. Then, a couple of weeks ago I was out going to yard sales and a fella was selling about a dozen of them. He finally told me what I have. I've spent hours and hours on google since then trying to determine if they have names and what to call them. If I'm understanding what I read correctly, there are all types of accessories that can be added to the figurines. I will be selling all of the items in various lots of different types and amounts. But I'm still struggling with what to call most of them. I'm sure that the titles that I assign to each lot may not make a lot of sense to you buyers, but it's the closest thing I could come up with. I suspect when I get them all listed there will probably be over 100 lots listed, so please be sure to check my other listings. Buyer to pay $4.95 USPS First Class Mail Package shipping charges. Shipping is from Arizona.